Vegan Summer Shop-Up! | Food E.
Hi kids! I know, I’m posting on a Saturday. It’s bedlam. … I CAN understand the affinity for delicious vegan baked goods! I am telling you, these are some of the most delicious baked goods you will ever have. I can’t explain why they taste so perfect, but they do. 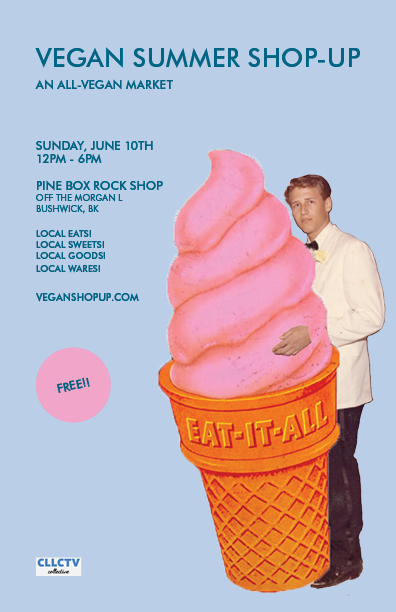 This Sunday, June 10, The Vegan Summer Shop-Up opens in Bushwick, Brooklyn, featuring all vegan eats. My friend Tommy will be there with his incredible baked goods for sale. Don’t miss out!